The Hank Aaron State Trail has been clear of snow for a while now, so I am back to riding on it. It still has a lot more ice patches than the roads, but I ride slowly and have studded tires. The trail adds about two miles to my five mile ride to work. I prefer the longer ride for the exercise and the friends I meet on the trail. Mr. Picasso grows a nice warm coat for his winter walks along the Hank Aaron State Trail. I am forced to shop at Value Village for my outerwear. Mr. Picasso is the Menomonee Valley’s only permanent equine resident. He takes walks along the trail every day with his friend Andy, who was kind enough to take the photograph above. Picasso grows a nice thick coat to keep him warm this time of year. I on the other hand have to shop at Value Village for my coats. Recently I thrifted this long London Fog Trench for $9. I had a couple other similar coats, but they were the shorter versions that only come down to my knees. For a measly $9 I decided to upgrade. Trench coats are great winter commute jackets. Much like the waxed cotton dusters worn by people who prefer the original horse to the iron horse, long trench coats keep the tops of your legs dry when it snows. The combination of a long trench coat, long ski socks and wool pants keeps me very comfortable while riding in even very cold weather. It allows me to forgo the long-johns which, as I have mentioned in the past, are too warm to where all day in my office. The Therma Jock (before you follow the link, be warned it is exactly what it sounds like). You can also buy windproof undies from Craft. Not something you’d wear to be “cyclechic,” but if cold-weather training is more your bag (! ), they work well. X-rated content for Xmas. Not exactly what I expected. I talked to Andy about that, and he is still wants to sell the boat yard. He said he has had some interest, but nothing is pending. Nine miles is about the perfect commute distance. I used to commute back and forth to Waterford, which was 28 miles each way. That is the reason I don’t work there any more. Congrats on the move to your new office and a doable commute. Wow, I have been joking about getting someone to make me a weiner cozy for years. I’ve had success by simply stretching the hem of my jacket over the nose of my saddle. Would a Hoan marsupial bridge be the perfect bridge? Way too expensive given the deck of the bridge has plenty of capacity to spare. I was wondering what you thought about wearing cyclechic clothes for long commutes. Did you wear regular clothes when you commuted to Waterford? My commute is about 12 to 14 miles one way and one day I tried wearing blue jeans on the commute. That was the end of my cyclechic experiment since I ended up with a large blister. From kindergarten through college, I always wore regular street clothes and never had any problems which I attribute to a lot of short little rides or commutes. It certianly couldn’t have been the Schwinn saddles. Just wondering if there are some finer points to wearing street clothes on long commutes or if it is just not possible if the trip exceeds a certian distance. Well, I think everybody has a different tolerance. 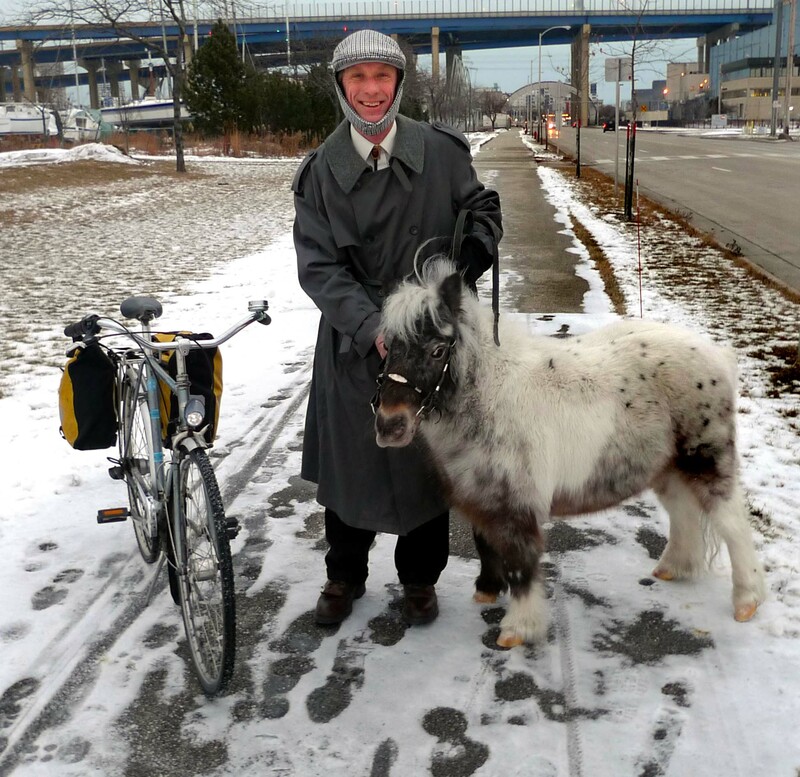 I have ridden to Madison and Chicago in regular clothes, but that may be just me. When I worked at Waterford, I wore coveralls at work. I typically wore lycra stuff for the commute and put on my coveralls at work. Sitting behind a torch and/or machine tool all day, I was super dirty and sweaty by the end of the day, so I often stopped at Lake Tichigan to swim on my way home. Wearing a jersey allowed me to jump in the lake and dry off as I pedalled home. Besides, I think 28 miles is a pretty crazy distance to commute by bike for 99.99% of the population. It is the reason I don’t work there any more. Anyway, to get back to your question, I think a 12 or 14 mile commute in regular clothes is possible in the cool weather, but problematic when sweating season begins if you have to wear dress clothes. If you don’t and you can wear quick drying underwear and pants then it should be possible. As far as saddle sores go, sitting all day in the same sweaty clothes can cause that. Changing or at least cleaning up with hand sanitizer would probably solve that problem.